VILLA EMO CAPODILISTA FOR EXPO 2015 During the Expo2015 the estate opens its doors with guided tours. You can admire the frescoes of Villa Emo Capodilista, taste and purchase the wines produced on the hill on which it stands and visit the collection of rural tools. 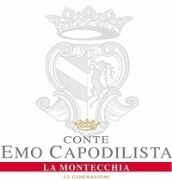 One of the architectural jewels of Veneto and of Italy, Villa Emo Capodilista, was built on La Montecchia, a hill of an extension of approximately 30 hectares, manly grown with vineyards. During the Expo2015 the estate Conte Emo Capodilista invites you to combine art and taste, opening the doors of the Villa and the Cantina. Exceptionally it will be possible to have a walk through the vineyards of the estate and climb slowly up the hill enjoying the panorama that gradually expands from the Euganean Hills to the Alps. You are going to admire the frescoes by Dario Varotari (pupil of Veronese) and from the lodges you will recognize the trail just walked through the vineyards, with backups made with logs of acacia, and grown without the use of chemicals, completing a cycle of sustainable agriculture that allows the use of biomass for heating and solar energy for the production of electricity. Once off you will be welcomed in our wines store and guided through the tasting. We are going to open also our collection of rural tools, if you want to learn more about the tools that were used in past centuries in the countryside of Padua, in castaldie and cellars. The visit is possible for groups of 15 people (only with reservation). Originally a hunting lodge built in 1568, this was the brainchild of Dario Varotari, a painter flirting with architecture, a pupil of Veronese who remained faithful to his own métier and covered the rooms in mannerist frescos: scenes from mythology and family history, putti, grotesques and vignettes. In keeping with the open, hilly situation, Varotari designed a severely square building with identical facades: each with two side towers between which extend double-storey loggias. The formal severity produces a delightful contrast with the playfully theatrical loggias, their frescos and their elaborately decorated pediments. The basically square structure of the hedge-lined terrace is also broken up by semicircular extensions, so-called exedra. The hill provides a splendid view - it is reminiscent of Leonardesque backgrounds - across a luxuriant plain, sprinkled with cornfields and vineyards, terracotta-coloured farmhouses and gardens, poplars and cypresses, bordered by the Euganean Hills. These are, so to speak, the local mountains for Padua and for Venice. On a clear day, they can be seen from the Serenissima, some 40 km to the east. · possibility of purchasing products. The estate has been owned by the same family for 22 generations. Villa Emo Capodilista, was built on La Montecchia, a hill of an extension of approximately 30 hectares, mainly grown with vineyards. The Estate, that is part of the Colli Euganei appellation and supports the foundation Slow-food for Biodiversity, also offers hospitality and it borders with the Montecchia Golf Club together with a restaurant, that was recently awarded a Michelin star and that is run by the Alajmo family.